Things come and go in New York City — it's always been that way — but a few of Manhattan's grand old hotels remain. Nowadays they're owned and managed as luxury brands by massive hotel companies, but if you're lucky, you can step into a place like the St. Regis, sit for a moment in an ornately decorated lobby, and imagine yourself back to an earlier time. The St. Regis Hotel was built in 1904 under the direction of founder John Jacob Astor IV, and it was declared a New York City landmark in 1988. (If you're ever in the neighborhood and you're in the mood for a classic cocktail, I highly recommend a visit to the St. Regis's King Cole Bar.) And now it has its own signature scent, in the form of a room spray and candle developed for Arquiste by perfumer Rodrigo Flores-Roux. This new St. Regis brand fragrance is called Caroline's Four Hundred, and it's "inspired by the floral arrangements of one of the most splendid balls of the Gilded Age." "Caroline" is Caroline Schermerhorn Astor, mother of John Jacob Astor IV, and "Four Hundred" is a reference to her guest list strategy. Faced with the ever-expanding number of millionaires in Gilded Age New York, she and "society expert" Ward McAllister compiled a directory of the four hundred New Yorkers who (in their opinion) truly mattered in high society. Mrs. Astor's parties were legendary, so there was lots of competition to attend. Arquiste Caroline's Four Hundred reportedly includes all these floral notes in its composition — the list is drawn straight from that account, with the exception of the azaleas. (Poor azaleas.) I can't pick out most of these individual notes, but the overall effect is right: it's a profusion of hothouse flowers, just delivered from the florist, cool and fresh and just a little artificial-smelling. The rose is definitely there at the center, and it's complemented by fruity notes of apple and melon with some dewy green leaves. When I spritz Caroline's Four Hundred on paper, rather than into the air, I'm able to pick up more of its nuances, including a silky lily note under the rose. Caroline's Four Hundred is a very feminine fragrance by present-day standards (and it would probably sell well in perfume form). For a room fragrance, I usually prefer something a little deeper and earthier; actually, I'm tempted to spray this scent around the room while I'm burning a candle with notes of wood and leather and cigar smoke (any suggestions? 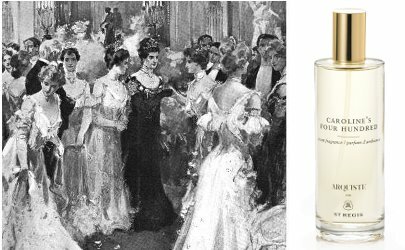 ), in order to evoke the full smell-spectrum of a turn-of-the-century ball with four hundred guests. Maybe Arquiste could be convinced to issue a companion fragrance. In any case, I bet Mrs. Astor (even in 2016, I don't dare call her "Caroline") would be pleased. Arquiste for St. Regis Caroline's Four Hundred Room Fragrance is "featured at all St. Regis Hotels and Resorts around the world." It's available for $85 (100 ml) at the St. Regis online boutique. A matching candle is also available for $85. 1. New York Times, January 29, 1900. You can also view a transcript of the article here. The menu and the descriptions of the guests' outfits are worth a read. Note: top left image is Caroline Schermerhorn Astor and her guest at one of her lavish balls, New York 1902 [cropped] via Wikimedia Commons. While it’s interesting to read about that time, I don’t want a perfume that smells like the “400” and neither does it even remotely smell like what I would imagine her ballroom did smell like! I was amazed to see how far afield the “St. Regis” brand has spread — hotels all around the world! I suppose it makes a nice souvenir? One thing did surprise me is the very plain bottle and box. Surely something named for Mrs. Astor deserves a more opulent package! I’m surprised at how utilitarian is the whole package. A floral air spray in a plain bottle… reminds me of something you would pick up at William Sonoma. The opposite of the Astor opulence in my mind. But what do I know? I know! I wonder why Arquiste/St. Regis didn’t invest in more “gift-worthy” packaging here. A curvier bottle with an embossed cap, a patterned box like some circa-1900 textile…? I loved the St. Regis when Lespinasse, a very old school French restaurant, was there. It closed, sadly, but I’m so glad I had the opportunity to experience a meal there more than once. I’m with you, Jessica, on preferring the more “deeper & earthier” room scents. My favorite right now is a linden & moss candle. Love it! For some reason, as much as I love floral perfumes, I like my home fragrances to be a little different — Diptyque Baies has greenish notes along with the rose and blakc currant, so that’s one that that I enjoy in summer, but otherwise I like candles that smell a little incensey or have deeper fruit notes. I prefer lighter room scents and think it sounds nice. But, who am I kidding? I’m wondering how wearable it would be as a perfume. At $85 for 100ml it would be a steal and I’m not above wearing room spray on my person (after patch testing, of course). The bottle, though, does not say “Mrs. Astor approved” to me. What a plain bottle! It doesn’t suit what it is supposed to represent. Mrs. Astor wouldn’t sell it for just $85. I could see her with Amouage Gold especially if it was sold in the old bottles. I can definitely see her displaying some Amouages and Guerlains on her very fancy dressing table! I don’t know about the room scent and candle (they sound pleasant enough though I’d expect something quite a bit more elaborate), but I loved reading that NYT article. Some of those gowns sound stunning, the food amazing and it was such a fun read to a time so long ago… Thanks for linking it. I’m glad you enjoyed it! I loved reading the descriptions of the gowns and jewelry, too. So interesting to think that ordinary New Yorkers sat and read these accounts of society balls the next day. Really, our celebrity fashion blogs and such are nothing new! I’m a sucker for a good story. Nonetheless, one of my rules of thumb based on hard won experience is that the quality of a scent often declines in proportion to the complexity of the marketing prose. This doesn’t seem to be the case with Arquiste, however. Their fragrances are often wonderful and usually have a clear and thought provoking connection with their back stories. I think Rodrigo Flores Roux is a really good perfumer and I’m really interested in trying this one. I know I’ll miss my fragrant garden in the cold of winter and am wondering if this might help me get through until spring.